The Organic Liquid Hand Soap only requires the addition of fragrance and colour to produce a luxurious feel liquid soap. On its own this is quite a runny liquid but adding fragrance oil or essential oil will thicken this soap base, so we would recommend trying this first in a small quantity to ensure it meets your requirements. Some essential/fragrance oils will work better than others so it really is a good idea to test on a small quantity first. If you find that it is still not thick enough, or you prefer to use it with out any fragrance oils, then you can thicken it by using plain household table salt, the finer the better. Try a very small amount first. We experimented with half a teaspoon for 300ml of soap and it gave a good result. Sprinkle the salt into the liquid soap and let it dissolve by itself - this may take a couple of hours. It may look a bit odd when you first add the salt, as it will look as if it is clumping together but it will dissolve. 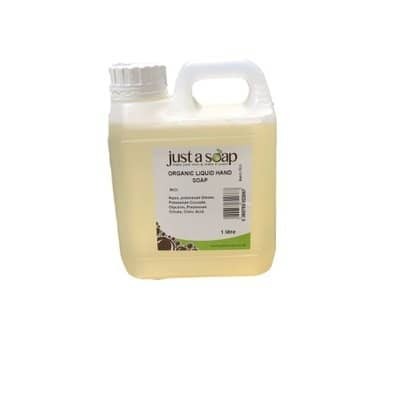 We really like this Liquid Soap Base which is based on Sunflower Oil as it is so mild and gentle. It still produces great lather even though there are no added surfactants like SLS. This is not a concentrate and can be used just as it is straight out of the bottle. If you do wish to add fragrance then we would recommend a quantity up to 2%. Available in 1 litre bottles with quantity discounts available. Ingredients: Aqua, potassium oleate*, potassium cocoate **, glycerin ***, potassium citrate, citric acid. * derived from organic sunflower oil. ** derived from organic coconut oil. Aqua, potassium oleate*, potassium cocoate **, glycerin ***, potassium citrate, citric acid. How to make Hand Wash using Liquid Castile or Liquid 105 Soap Base from Stephenson Personal Care on Vimeo.